A rotten compromise has just been approved, amid great fanfare from both pro-GMO and anti-GMO sides, which will allow national governments to individually decide whether or not to ban GMO crops on their lands. The German Environmental Ministry immediately announced that it plans to introduce a German ban on planting of all GMO crops. Sounds like a victory for sanity and a sound defeat for Monsanto of the USA, the world’s largest purveyor of patented GMO seeds and the toxic Roundup herbicide chemical paired to their seeds. In fact it is a stunning defeat and will result in a massive spread of GMO crops in the EU for the first time. The EU Parliament in Strasbourg has passed a final law that allows member states to decide on the production of GMO, by 480 votes to 159, with 58 abstentions on January 13. It is being sold as a “win-win” when it is in fact a lose-lose. The strong EU resistance over more than two decades to the destructive spread of GMO crops has just crumbled and many believe the opposite has taken place. The situation before January 13 in the EU was that despite a corrupt European Food Safety Authority in Brussels and despite corrupt EU commissioners who have repeatedly shown they are ready to compromise fundamentals of EU food security, health and safety, Monsanto and the powerful USA and EU agribusiness lobby that is so “persuasive” in the dark corridors of Brussels had only been able to get away with cultivation of one single GMO plant since 1998—Monsanto’s MON810 maize. And more than 90% of all EU MON810 GMO maize is being grown in Spain where Dutch and other giant agribusiness groups have enormous influence. The small remainder is grown in Portugal and the Czech Republic. That meant that in practice before this new law, except for southern Spain, the EU was virtually GMO free. That was something Monsanto and their friends in the Rockefeller Foundation were not at all happy about. 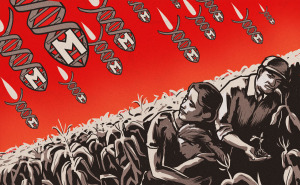 The GMO resistance of the EU was used by many smaller developing countries in Africa, Asia and elsewhere to argue for refusing to allow planting of GMO on their soil. Now Monsanto has just managed to ride a giant Trojan GMO Horse into the EU. The devil is in the details of the new compromise law. Brussels and its corrupt EFSA has seven other GMO plants in the pipeline for approval for commercial cultivation aside from MON810. The new EU Parliament vote means that now those seven will likely begin to be planted on EU soil. The pro-GMO governments of Britain and Holland both are expected to OK GMO planting. Both are dominated by international agribusiness and pro-GMO companies like the Anglo-Dutch giant, Unilever. The European Parliament’s Environment Committee voted last November to impose strong safeguards on GMO cultivation. But then the draft law went to the “Trilogue” – the European Council, the EU Commission and representatives from the Parliament – for amendment. Finally on December 3 a deal was forced through which stripped out most of the safeguards. While national GMO opt-outs remained, any such opt out will only be allowed under highly restricted circumstances. The new law has eliminated and liability of farmers or GMO companies who plant GMO if their seeds are spread to neighboring farmland by airborne vectors, a common reality. As well the rules that govern EU trade will make it illegal for member states to control imports of GMO foods, even if they forbid their cultivation. Until now the only import of GMO was in the loophole agreement with the USA grain cartel that allowed animal feed containing GMO corn and soybeans to come into the EU. The new law will spread that to GMO crops generally that will now begin to be grown inside the EU for the first time on a large scale. Certain is that this new rotten compromise will result in more proliferation of GMO crops and their toxic chemical glyphosate herbicides across the EU as now the situation will be exploited ruthlessly by Monsanto and company to establish “facts on the ground” and introduce GMOs as widely as possible with a minimum of regulation.